← Is three a crowd? Leonardo Live: Art meets Popcorn Or: Who’s rolling in the grave harder, DaVinci or McLuhan? Technology has provided an opportunity for people across the globe to experience phenomena that they may not otherwise have. Think of how much children can learn about other cultures and countries through National Geographic. Now, thanks to high definition film and live broadcasting, experiencing culture has moved into the movie theatres, but should it be there? A few weeks ago, I was in a movie theatre, to enjoy a live broadcast of an opera from the Met in New York. Even as I was contemplating how odd it was to go to the opera in jeans and snacking on popcorn, I was even more surprised when the preview was a “live broadcast” of an opening of the majority of DaVinci’s works on display at the National Gallery in London. I was super surprised and even let out an audible “HUH?”. The experience of viewing art compared to a reproduction, even it if it is a reproduction that is equal proportion, rarely compares to seeing the original. 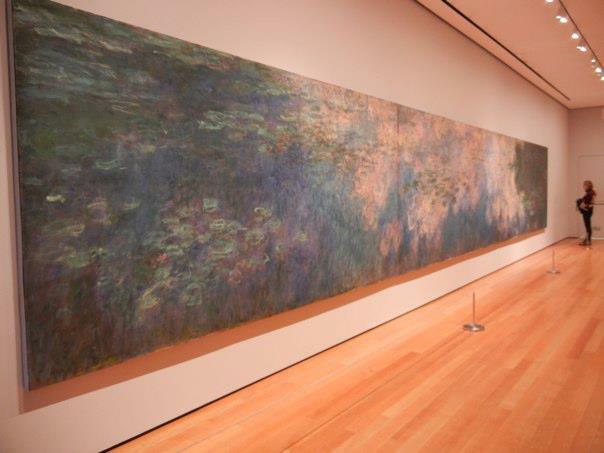 I enjoyed Monet’s Water Lilies, but was absolutely gobsmacked when I saw one of the original pieces at the MOMA, all 20+ feet by 6 feet. And the size of it was part of the message. Money wanted the viewer to feel as if they were immersed in a pond at Giverney in an out-of-body experience. How would a broadcast of an art opening, compared to the “New Years Rockin’ Eve” special in the New York Times (Smith, 2012, C1) be able to replicate the experience of witnessing Da Vinci’s works in real life? I was reminded of the articles we read on presenting art in different media and my own entrance into art appreciation. In Guglietti’s article on aboriginal Internet art, she cites Todd description of the Interne as a “power to alter the way humans relate to each other and the environment.” (Todd, 1996 in Guglietti, 2010, 134). Technology can’t replace the first-hand experience, but it opens the door and provides an introduction to new things with minimal investment from the viewer. The hope for these high definition broadcasts of culture in the movie theatre is to create the affect, that connection between body, culture and feeling (Bociurdiw, 2011, 29) to inspire neophytes to learn more and perhaps go to a gallery. However, this international affect may cause more harm than good. By setting the expectation of art at the level of DaVinci’s masterpieces, movie theatre goers will set the expectation of “art” in their minds as those works, rather than the local artists who better represent provincial and Canadian culture and, frankly, need the money more than dead masters. Do these exhibits in movie theatres inspire viewers to open themselves to art, to book a ticket to Europe to breeze through the Louvre? Bociurkiw, M. (2011). Feeling Canadian: Television, nationalism, and affect. Waterloo, Ont: Wilfred Laurier University Press. Guglietti, M. V. (2011). Aboriginal internet art and the imagination of community. In K. Howley (Ed. ), Understanding Community Media (pp. 133-142). Thousand Oaks, California: Sage Publications Inc.
Gallery | This entry was posted in media culture society and tagged affect, art, culture, da vinci, high definition, movie, theatre. Bookmark the permalink.